Make Castle Rock your northwoods home away from home on the beautiful shores of Lake Superior. Enjoy Lake Superior Views from this beautiful and luxurious vacation rental home. Castle Rock is a large private home located on Cascade Beach Road in Lutsen, MN. The floor to ceiling windows in the spacious living room provide amazing Lake Superior views and a gas fireplace. Nice living room furniture makes it easy to relax and watch TV or check out the waves from the floor to ceiling windows. The open living space is great for large groups and includes a dining room table that seats 8. The large modern kitchen is a great place to prepare meals. The open living space is great for large groups and includes a dining room table that seats 8. Property features a nice Stereo and CD Player in the dining area. In the summer months, don`t miss the chance to eat outside to contemplate the wonderful view of this big lake. The master bedroom features a king bed and jetted tub. Relax in the tub while enjoying beautiful views. Master Bedroom and living room share a nice and big balcony. The main level bathroom has a shower/tub combo. The loft bedroom features a king bedroom and is open to the living area below. The family room on the lower level is a great place for Family Game Night or to just hang out and watch a movie. Play a hand of Poker or Go Fish around the card table. Family room has access to the patio area. And a TV with space for everyone to watch a movie together. The first guest bedroom on the lower level has a king and a queen bed. The second guest bedroom on the lower level has a king bed and twin bunk beds. The lower level bathroom features a shower/tub combo. Two upper level balconies one off the dining room and one off the living room provide a great place to sit back and watch the waves roll in. The patio off the lower level living area is great for enjoying a meal outside. BBQ included Grill out on a warm summer`s nice. The two balconies and walk-out patio provide amazing views of Lake Superior. Make smores in the fire pit on warm summer evenings. Grill up some burgers while listening to the waves lap against the Lake Superior shoreline. Enjoy 100 feet of private cobblestone shoreline. The sounds of the waves plus the stones rolling together as the waves crash on them is one of the most beautiful sounds You`ll ever hear. With only one visible neighbor you will enjoy utmost privacy during your stay. The gorgeous cobblestone beach is for you to enjoy during your stay. While the neighbors are close only one is visible from the home and they respect your privacy if you respect theirs. Castle Rock can be your next vacation destination on Lake Superior`s North Shore. There's room for everyone in this stunning home on Cascade Beach Road in Lutsen. Features include 3 bedrooms, 2 bathrooms, a loft, and a fun game room/second living room. The spacious open-concept living area on the main level features floor to ceiling windows with incredible views of Lake Superior, TV, a dining room table with room for 8, and a large open kitchen. There is a large balcony area off of the dining room. The master bedroom suite boasts a 2-person jetted tub, a beautiful 4-post log bed, and a large balcony. The lower level is a family gathering place with a card table, comfy couch, TV, and two bedrooms - each with a king bed (and more!). Stroll out onto the walk-out patio with a charcoal grill. Finally, the loft area has yet another king bed for a total of four king beds! This home is great for a group of friends or a large family get-together. Located on the highly desirable Cascade Beach Road just a few short miles from Lutsen, you can also enjoy 100-feet of private cobblestone beach. Walk out the door and you are right on the beach with Lake Superior lapping at your feet. Castle Rock gets its name partially from a small rock just a few feet off shore that rises above the water- almost like your own personal mini island! Once you arrive, you may never want to leave! Should you choose to go out and explore, however, Castle Rock is centrally located between the towns of Lutsen (5 miles) and Grand Marais (15 miles), plus you are just 5 miles from Cascade State Park with a beautiful waterfall. Miles of hiking and mountain biking trails are an easy drive away, and Lutsen Mountains Ski Resort is just 7 miles away and features year round activities. The Superior National at Lutsen Golf Course is also just 7 minutes away so bring your clubs (or your fat bike during the winter season) and enjoy this gorgeous golf course overlooking Lake Superior. Many dining and shopping options are also just a short drive away. Want to to know what's around Castle Rock? How close it is to the shoreline? How gorgeous the view is? Check out the aerial tour! Very nice, spacious location on Lake Superior. Large flat screen TV was appreciated for playoff game viewing. Nice sized kitchen and dining area. great house, teenagers loved it. we were close to all the hikes we chose. everything very clean and easy to locate. did most of our own cooking and only missing item was a cheese grater! otherwise, the house was very well stocked with anything we needed. we had a fabulous time. always planning for next year. Wonderful, cozy home with a spectacular view of the lake. Castle Rock was absolutely stunning. Views of the lake were phenomenal. The drive North to Grand Marais was less than 20 minutes. Weather was crummy, but Castle Rock was comfortable enough to just relax anyways. 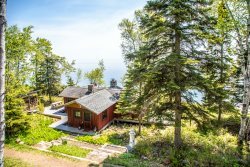 This cabin is located in a perfect place between Tofte & Grand Marais. Lots of room to relax and the beds were very comfortable. It is not secluded compared to other cabins so we appreciate knowing where the private property was located so we didn't encroach on someone elses vacation time.